Following on from “Jasper, a wolf cub who was scared of wolves” and “Billy, the bird who was scared of heights ”, here’s another must-have for your iPad! There was once a little pig who was scared of getting dirty! YUCK! This third book in the “I’m not scared Collection” will help your children grow! An original story specially adapted to the iPad, for children aged 3 to 7. The voice of Matthew Geczy, with specially composed music, will guide your children through the story, stimulating their imagination and appetite for reading. 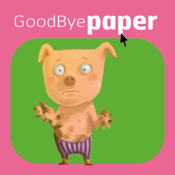 GoodBye Paper publishes e-books that feed the imagination. •14 pages that are beautifully illustrated (by Arnaud Bouron, director of the "le Petit Nicolas" series on M6) and cleverly animated, on 2/3 of the screen. •You can cut out the voice and/or the music so that you can tell the story the way you want to. Older children will also be able to read the story themselves. •Puzzles: 15 puzzles to play with based on the illustrations in the story, with 2 levels of difficulty (9 or 16 piece puzzles). •Memory game: 2 levels of difficulty (8 or 16 cards). •Mix and Match game: Let your child tell the story by putting it back in the right order! Mimi, the owl who was scared of the dark . Santa’s Apprentice - The First Toy.